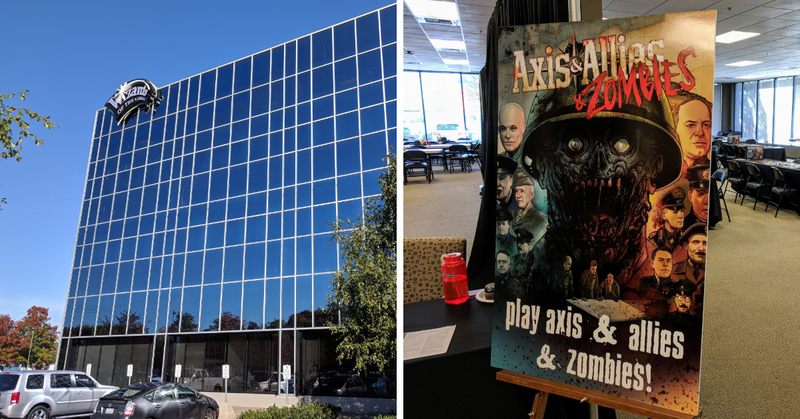 Last Thursday, September 27, Wizards of the Coast hosted an Axis & Allies & Zombies launch party with the Greater Puget Sound Axis and Allies Meetup Group. 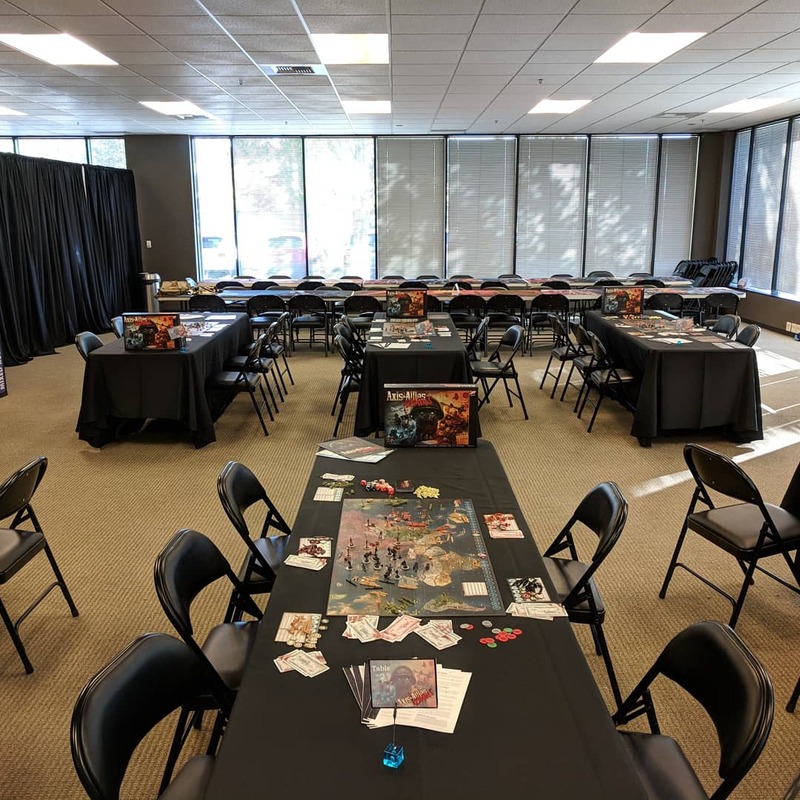 There were about 25-40 people in attendance including members of the meet up group, the game designer, Scott van Essen, several Wizards of the Coast employees, Greg Smorey of SmoreySwamp, a few folks from the forums, and myself, Dave Jensen. 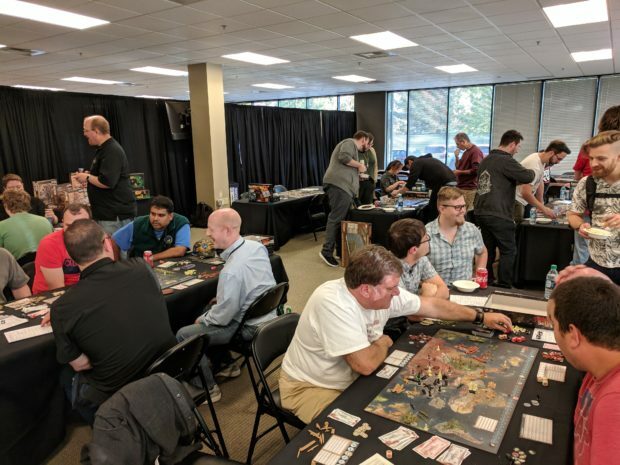 Disclaimer: Wizards of the Coast paid for my travel to their headquarters in Renton, Washington for this event. Axis & Allies & Zombies releases on October 26, 2018. Don’t forget to pre-order your copy on Amazon for only $40. The event kicked off with a socializing over snacks, including a few zombie themes snacks like Zombie-Os and AAZ zombie cupcakes. 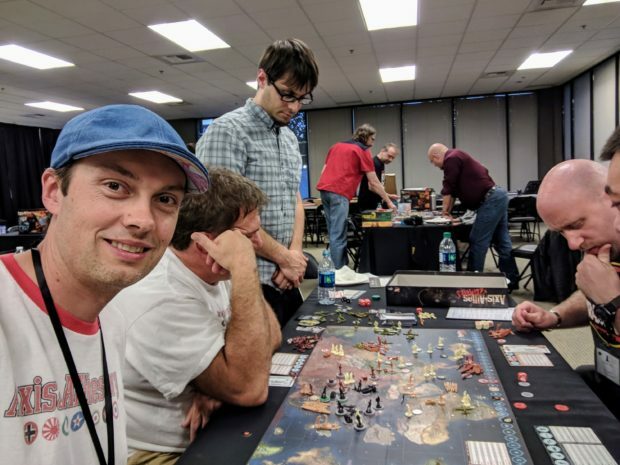 We had a chance to meet with each other and we discovered that there were several of us from the axisandallies.org forums: Gargantua, Marshmallow of War, Caesar Seriona, smo63, and a few others. We also had an opportunity to talk with Scott van Essen about the game and how it was developed. We learned that Scott and his team tried several different game mechanics before the rules were finalized. 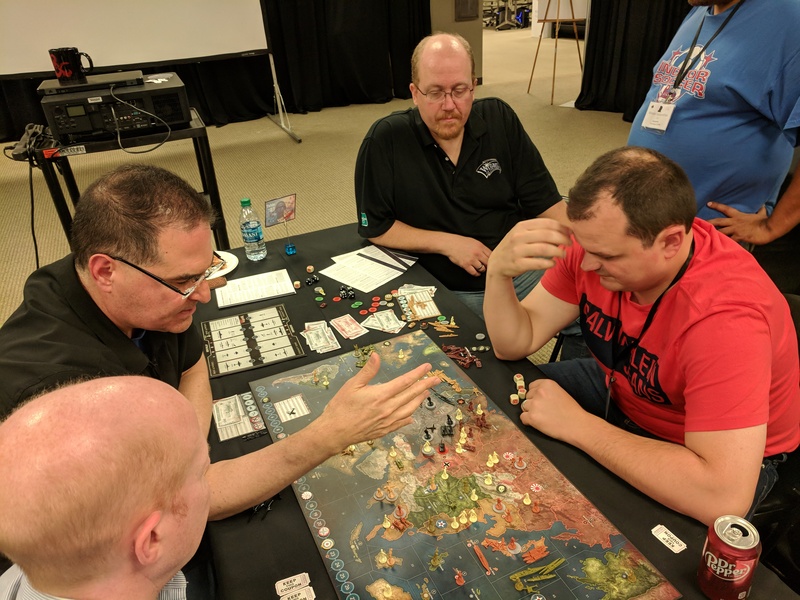 For instance, at one point they tried a mechanic where the Zombies would automatically spread to adjacent territories, which sounded similar to Pandemic. 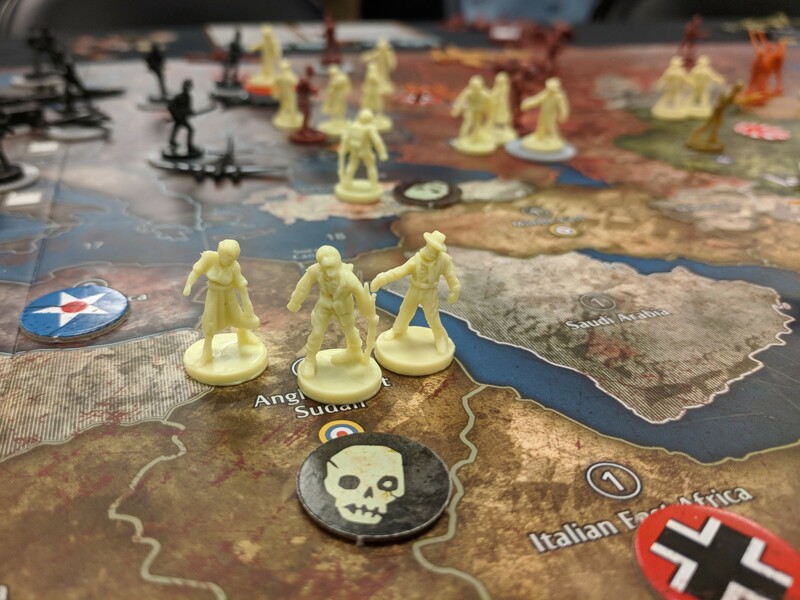 After play testing that rule it was quickly eliminated because the number of zombies on the board quickly spiraled out of control! Scott had several more stories like this and we’ll sit down with him later to dig more into the development of the game in a future post. 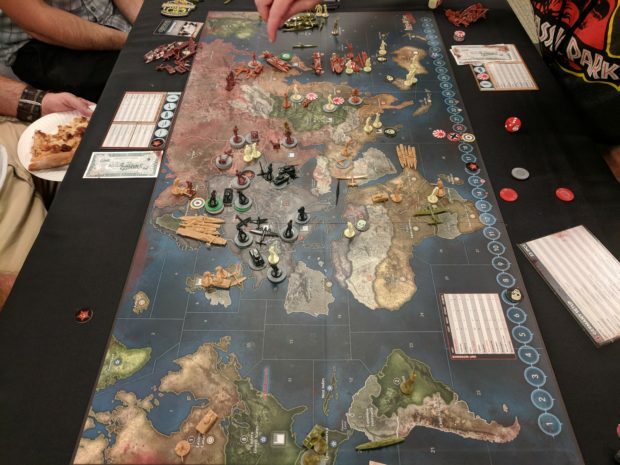 After socializing, we were given an overview of how to play Axis & Allies & Zombies and how it differed from the standard A&A rules. Finally it was time to sit down and play! During game play, prizes were raffled off, a table full of A&A and other Avalon Hill games, courtesy of Wizards of the Coast. 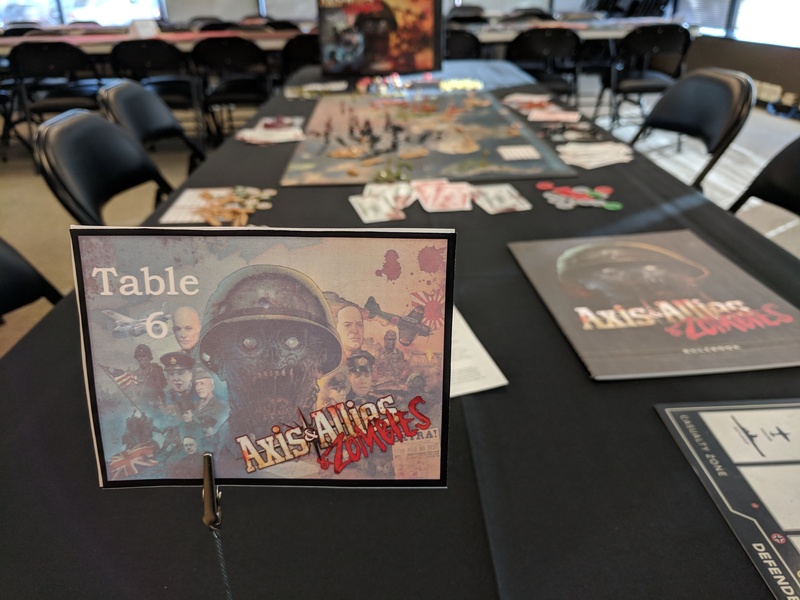 After the event, everybody went home with their own copy of Axis & Allies & Zombies and Scott was more than happy to sign copies. Although I had seen an early copy of Axis & Allies & Zombies at Gen Con, this was my first time sitting down to play the game. The map is gorgeous, it looks like a combination of Axis & Allies Revised and Anniversary Edition, with clear borders and spacious territories. The maps has more territories than 1941 but fewer than 1942. The zombie pieces come in 3 sculpts and definitely stand out on the map. Walking around the room I was able to quickly get a good sense of how badly the zombies have taken over in each game and it did vary in each game. The zombie cards ensure that you won’t play the same game twice. 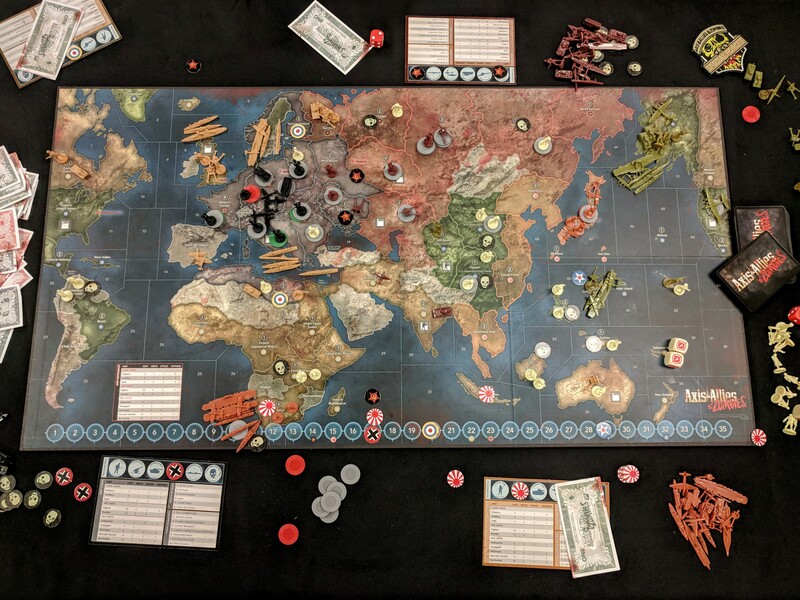 The first turn or two might result in familiar opening moves but even after the first turn you’ll have at least 5 zombies in random territories on the map and even more where battles have occurred. Another thing about the zombie cards is that the bottom part is technically optional but you really should play it. It help bring some balance and positive surprises to balance the constant threat of zombie units. 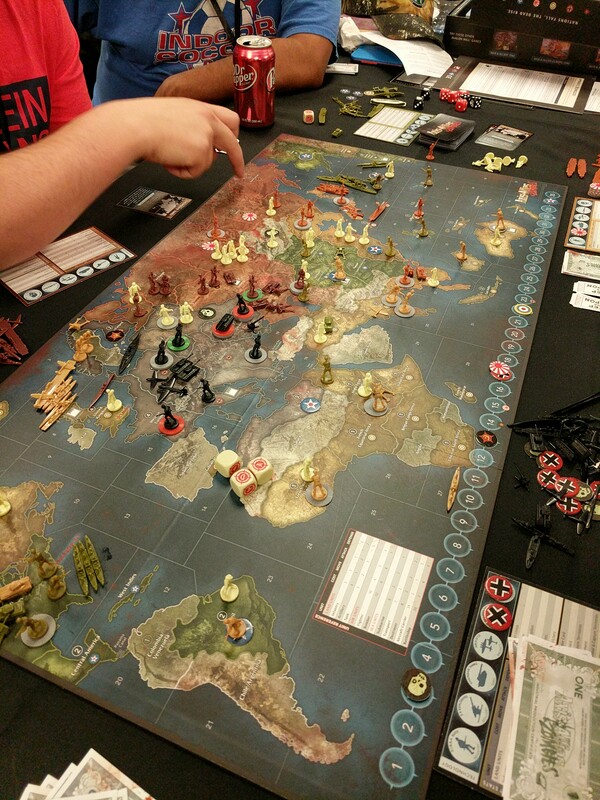 I almost never play with the technology chart in Axis & Allies games but in Zombies you really should. 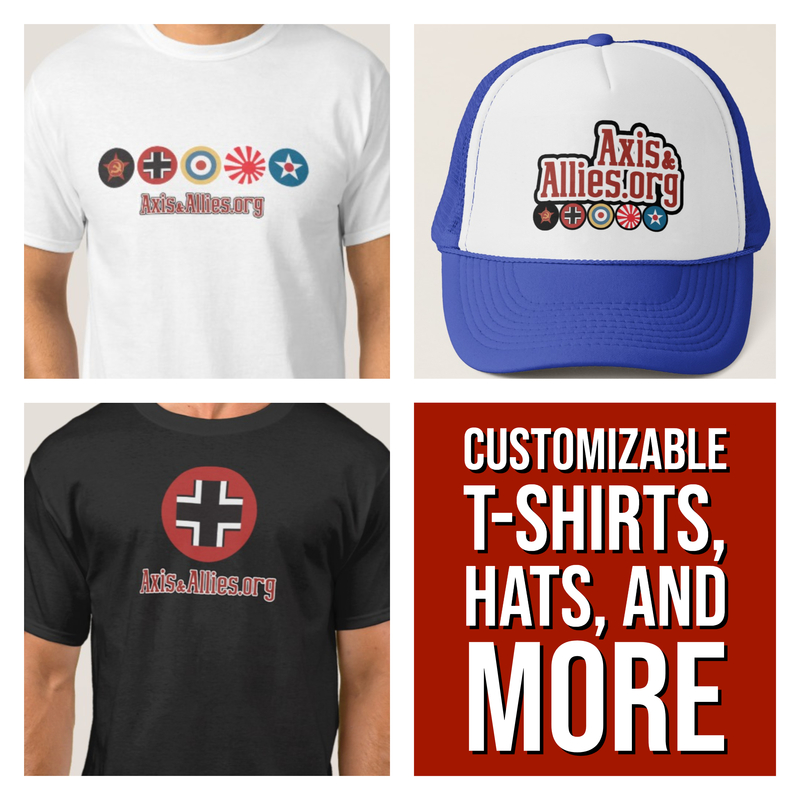 All of the technologies affect zombies and help you in your quest to eradicate them. Just don’t forget to use your technologies. I had chainsaw tanks and kept forgetting to use it. Attack and retreat becomes much more common. If you get a bad first roll or if you’re just trying to generate more zombies in the territory that you’re attacking, you’ll notice a lot more retreating in this game. Purchasing units at the end of the turn takes a little getting used to but I do like it better. It speeds up the game. If you played this in a regular game of A&A, you can still get your purchase ready but it’s nice to know that as you do your turn, if you messed up your purchase, you don’t have to worry. Recruitment centers are also useful and it’s something that I look forward to in any future versions of the game. The industrial complex in Australia is a little odd, however, it does introduce more possibilities for strategies and makes that region of the Pacific seem less isolated. More of the map is used in this game. 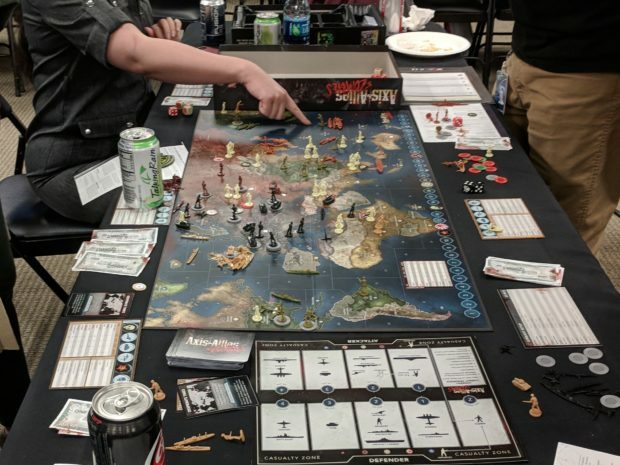 It’s important to remember that if there is a zombie controlled territory and you attack that territory (and survive battle), that territory is liberated even if there are still zombies in it. Also remember that when attacking zombies, you can quit the battle without retreating. This is important because when you liberate a zombie controlled territory, you are rewarded with one infantry. Zombie cards can also drop zombies into neutral territories. 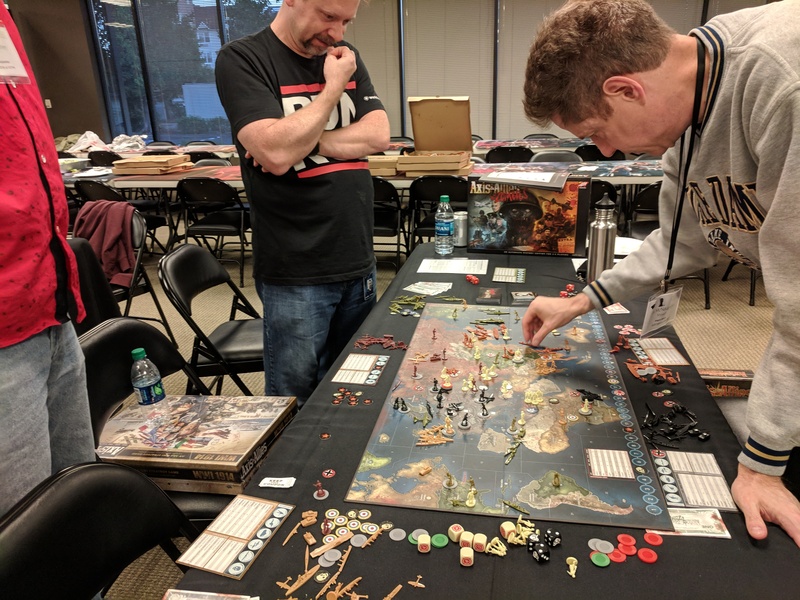 Finally, if the zombies control 25 IPCs of territories, the game ends. All of these rules result in a situation where you’re sending troops to territories like Central America, Brazil, Spain, Turkey, and Mongolia because it makes sense to both get the free infantry and gain more income. 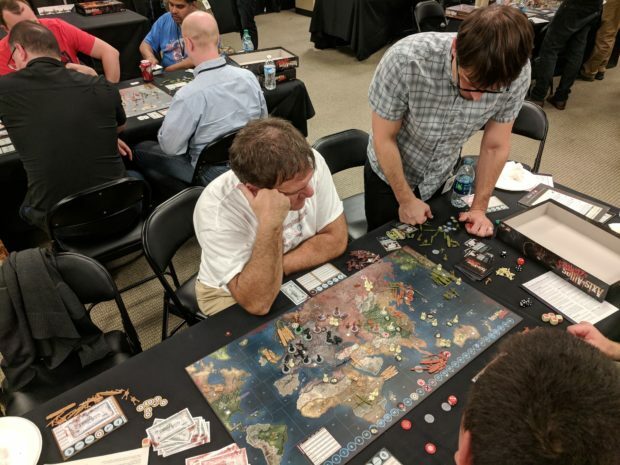 After we finished the evening I asked a handful of folks what they thought of the game. Many came in with low expectations and it seemed to exceeded expectations for all, the degree to which was the variable. The impressions of the game ranged from “okay” to “great.” I thoroughly enjoyed the game and look forward to playing it again. I really like the idea of an Axis & Allies game that can be played in 3-4 hours. Furthermore, this version has enough non-zombie changes that you could remove the zombies and still have a new and good A&A game. It might require some adjustment in unit placement for balance but it’s definitely something to try. It leaves me optimistic that a fresh Axis & Allies 1942 3rd Edition is possible and can have some fresh ideas. 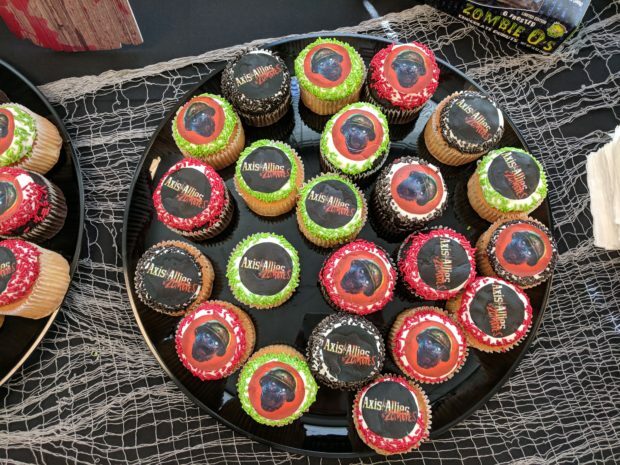 Special thanks to Shelly Mazzanoble, Brand Manager at Wizards of the Coast, for putting together this event. 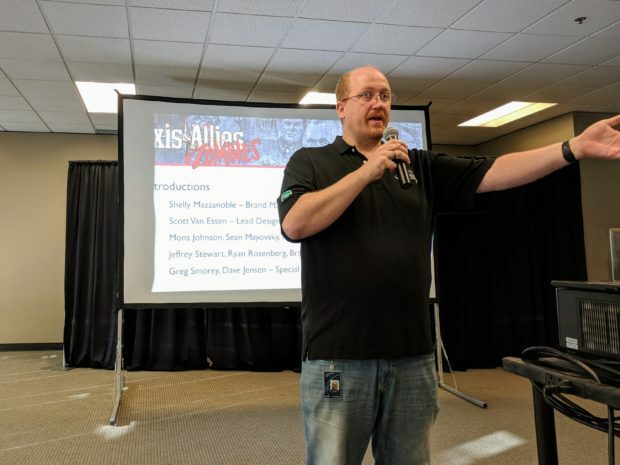 Also thanks to game designer Scott van Essen, Wizards of the Coast, and the Greater Puget Sound Axis and Allies Meetup Group for their involvement in making this happen.